The client, both dentists, wanted an easier way to provide after-hours care for their dental patients in case of emergencies. One that was third-party, secure, and convenient to both the dentist and patient. To understand the costs and how their idea could turn into a reality, they used Airship's mapping service and then continued working with Airship to design and develop their complete application called Loop. 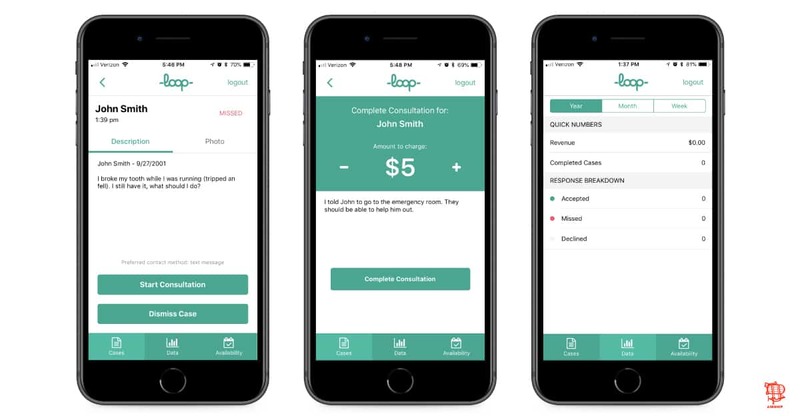 Loop's founders are new to the start-up world and were in need of a tech partner to help create a solution to a common problem they and other dental professionals were facing. Our crew was able to find that we could combine third-party services coordinated with a custom backend, saving the client time and money on development (because over-architecting to over-charge clients is not cool, obviously). The solution became an accessible web app for patients, an administrative portal for subscribing practices, and a cross-platform mobile app for dentists. Dentists are even able to connect with their patients using a secure communication tool that doesn't share personal contact information.